As promised, the hero of this post is lemon curd (that hopefully you’ve successfully made at home :p). 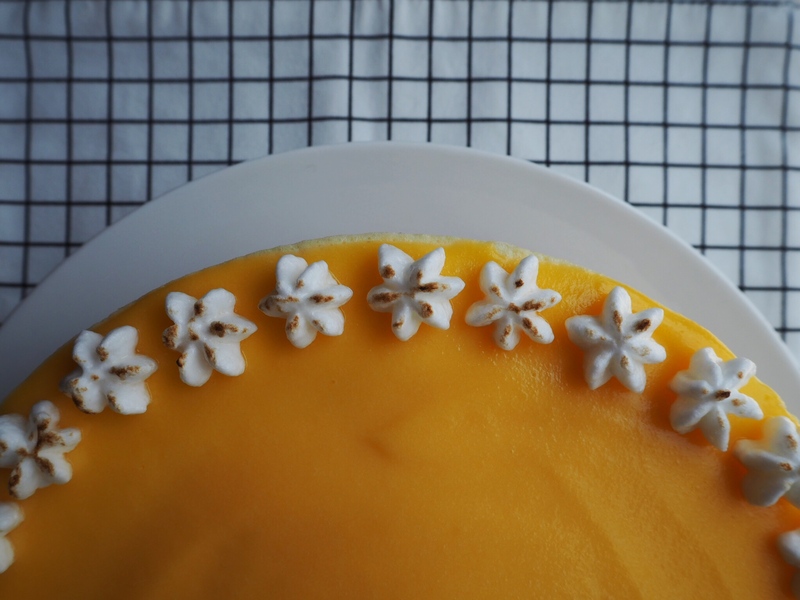 You won’t believe it, but this beautiful lemon curd mousse cake is downright my proudest creation throughout my 1 ½ -year-baking-life – so it’s already happily sitting on my still-imaginary-cafe’s menu waiting to be ordered and devoured! In my baking philosophy, balance is as important as flavour. The best desserts are those that deliver multiple complementary tastes and textures. In this balancing act, there is meringue and whipped cream, gently folded in, contributing to the lightness of the mousse. Then, I specifically chose macadamia as the cake base as it is crunchy and light. With the help of butter, it keeps the lemon from completely dominating the taste. So, from top to bottom, you get the marshmallowy softness of meringue, the creaminess of lemon curd, the airy feel of mousse, and the crunch of macadamia. They all come together to create the perfect mousse cake eating experience. All of that aside, don’t get intimidated by the numerous components of the cake. All you need is time and patience – something I didn’t have at all. Even I of all people am still learning to appreciate the beauty of it every time I’m in the kitchen. Good luck, and have lots of fun with this recipe! Line an 8 inch cake pan with parchment paper. Ground the nuts in a food processor or blender into a semi-fine texture with some crunch left. Add the melted butter. Mix well. Evenly distribute the mixture on the bottom of the pan and press with a spoon until the base is even and firm. Bake for 10 mins until golden brown. Set aside and let cool. Mix the gelatin powder with water in a small bowl. Slowly melt the gelatin by placing the bowl in a hot water bath; alternatively, you can microwave the gelatin-water mixture for 15-20 seconds. In a large mixing bowl, add lemon curd and gelatin mixture; mix well. In another bowl, add egg whites, cream of tar tar, and salt. Using an electric mixer, beat the egg whites at high speed until foamy. Gradually add the caster sugar using a tablespoon, and beat until thick and glossy. This will take about 5-7 mins. Gently fold the egg whites into lemon curd mixture in 3 additions. Using the same bowl and electric mixer, beat cream until soft peaks form (do NOT over mix). Gently fold whipped cream into the mixture in 3 additions. Pour the mousse mixture into the cooled cake pan. Refrigerate at least for 3.5 hours for the cake to set. Sift 50g of your homemade lemon curd to remove any lumps or zest. Evenly spread the curd over the top of the cake. Enjoy! !